The Coffee Mocha blend of chocolate, vanilla and coffee will make you think you are sitting in a coffee house. 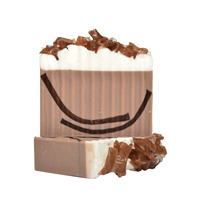 Relax in the bath or shower and drink in the aroma of this yummy soap. To microwave-safe measuring cup, add 12 oz. of cut up clear soap. Heat in microwave until completely melted. To melted soap, add 1/2 tsp. brown mica powder. Stir well to mix in. Place mold on scale and tare to zero. Pour 4 oz. of soap into loaf mold and let soap set up. Once soap has set up, remove from mold. Gently bend soap to form the shape of a cup. Set soap aside. Remelt brown mica soap if hardened. Pour another 4 oz. of soap into mold and let set up. Remove from mold and gently bend to form a cup-shaped "U". Set both soaps aside. Remelt remaining brown soap and pour into mold. Let set up. This will be the "chocolate shavings" for the top of the loaf. 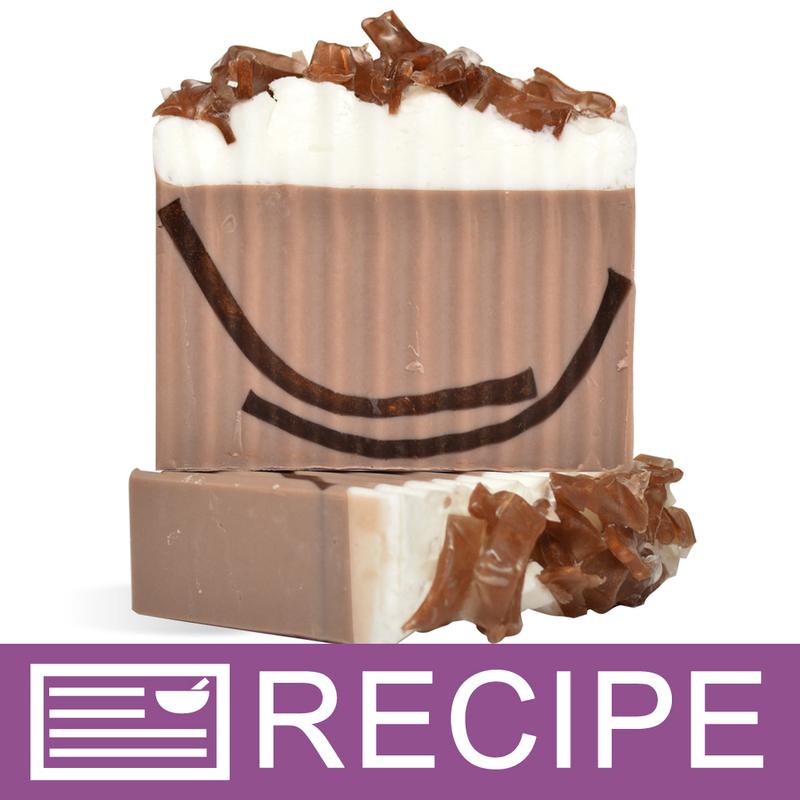 Using a cheese grater or potato peeler, make chocolate curls with soap. Set aside in bowl for later. Cut up entire 2 lb. tray (32 oz.) of white soap and place in large glass measuring cup. Heat in microwave until completely melted. Pour about 4 oz of soap into a glass measuring cup. Add 1/2 tsp. brown mica powder and mix with wire whisk. Add this back into larger batch of melted soap and mix well. If a darker shade is desired, repeat above step with more mica powder. This will ensure the powder is blended into the soap and does not speckle. In plastic beaker, mix 1 oz. of fragrance with 1 oz. of Vanilla Color Stabilizer. Mix well and let set for 2 minutes. Add fragrance mixture to soap and mix well. Fill about 1/3 of loaf mold with soap. 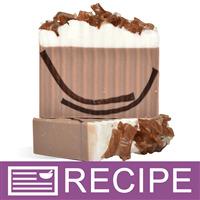 Take the 2 "U" shaped bars and spritz both sides of soap with alcohol. Place one piece into the soap on the left side of mold. Then place other piece into melted soap on the right side of mold. Let the pieces overlap slightly in the middle. Spritz with alcohol. Stir melted soap briefly, then pour over embeds being sure to pour behind them so entire loaf mold is filled with soap. When all soap has been poured, spritz top with alcohol. Let soap set up. Weigh and cut up 5 oz. of white soap base. Place in microwave and heat until melted. In plastic beaker mix 3.5 ml of fragrance oil with 3.5 ml of Vanilla Color Stabilizer and mix well. Let sit for 2 minutes then add to white soap and stir in. Spritz soap in mold with alcohol. As soon as whipped soap starts to thicken, immediately pour over the top of the brown soap. Peaks can be added to the top of the soap if desired. If soap gets too thick, reheat slightly in microwave, then whip just until it starts to thicken, again. Spritz top and sprinkle chocolate shavings made earlier. Gently press some of the shavings into the soap as they are sprinkled. Melt about 1 oz of clear soap in small beaker and drizzle over chocolate shavings. This will help the shavings stick to the whipped topping. Let soap completely set up. Carefully remove soap from mold. Gently pull soap away from sides, then gently push on bottom. You will see the soap release then carefully pull soap out. Using wavy soap cutter, slice loaf into 1" bars. Wrap in plastic wrap to keep airtight. Ingredient Label: Sorbitol, Propylene Glycol, Sodium Laureth Sulfate, Stearic Acid, Lauric Acid, Water, Sodium Hydroxide, Glycerin, Fragrance, Titanium Dioxide, Tin Oxide, Mica. "Can you use cocoa powder to color the soap rather than mica, or sprinkle it on top? I’ve seen people adding it to other products but I really don’t know where the line is with food. So much of it has cross over. If you can link me to articles on the subject that would really be wonderful. And thanks so much for all you do!!!" "Can you add ground coffee to this recipe? And if so, do you add used grounds or fresh grounds? " Staff Answer Yes you can. Used or fresh is your choice. The only difference is the level of exfoliation you desire. Used grounds will provide a softer exfoliation than fresh grounds. You alone are responsible for product and recipe testing to ensure compatibility and safety. If selling, you would need to change the INCI ingredient listing to reflect any substitutions or changes to our original recipe.